Seventy-six patients were treated with autologous onlay bone grafts. Of the entire sample studied, 69.7% (53 patients) did not show any type of postsurgical complication. However, 30.3% (23 patients) of them exhibited a type of complication, a summary of which is provided in [Figure 1]. 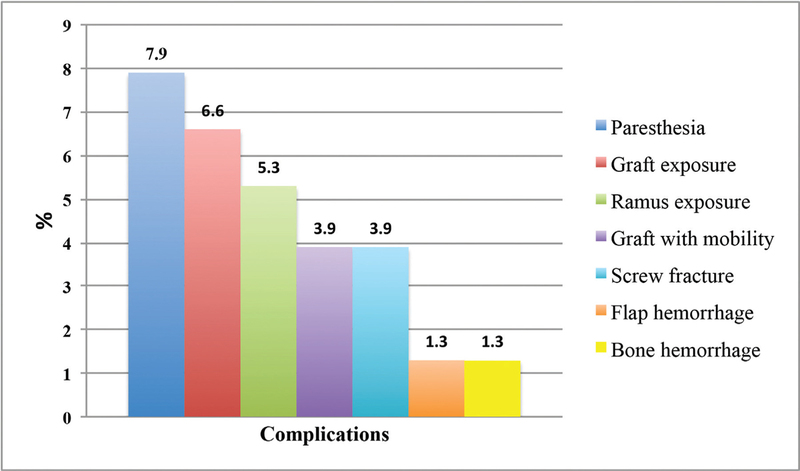 In relation to the recipient site, graft exposure was seen in 6.6% of the patients (five patients), 3.9% (three patients) exhibited graft mobility [[Figure 2]], 3.9% (three patients) showed a fracture of a fixation screw, and 1.3% (one patient) had flap hemorrhage. Chiapasco M, Di Martino G, Anello T, Zaniboni M, Romeo E. Fresh frozen versus autogenous iliac bone for the rehabilitation of the extremely atrophic maxilla with onlay grafts and endosseous implants: Preliminary results of a prospective comparative study. Clin Implant Dent Relat Res 2015;17:251-66. Misch C. Use of the mandibular ramus as a donor site for onlay bone grafting. J Oral Implantol 2000;26:42-9. Sjöström M, Sennerby L, Lundgren S. Bone graft healing in reconstruction of maxillary atrophy. Clin Implant Dent Relat Res 2013;15:367-79. Spin-Neto R, Stavropoulos A, Coletti FL, Faeda RS, Pereira LA, Marcantonio E Jr. Graft incorporation and implant osseointegration following the use of autologous and fresh-frozen allogeneic block bone grafts for lateral ridge augmentation. Clin Oral Implants Res 2014;25:226-33. Sakkas A, Ioannis K, Winter K, Schramm A, Wilde F. Clinical results of autologous bone augmentation harvested from the mandibular ramus prior to implant placement. An analysis of 104 cases. GMS Interdiscip Plast Reconstr Surg DGPW 2016;5:Doc 21. Aloy-Prósper A, Peñarrocha-Oltra D, Peñarrocha-Diago MA, Peñarrocha-Diago M. The outcome of intraoral onlay block bone grafts on alveolar ridge augmentations: A systematic review. Med Oral Patol Oral Cir Bucal 2015;20:251-8. Restoy-Lozano A, Dominguez-Mompell J, Infante-Cossio P, Lara-Chao J, Espin-Galvez F, Lopez Pizarro V. Reconstruction of mandibular vertical defects for dental implants with autogenous bone block grafts using a tunnel approach: Clinical study of 50 cases. Int J Oral Maxillofac Surg 2015;44:1416-22. Greenberg J, Wiltz M, Kraut R. Augmentation of the anterior maxilla with intraoral onlay grafts for implant placement. Implant Dent 2012;21:21-4. Misch C. Maxillary autogenous bone grafting. Dent Clin N Am 2011;55:697-713. Uckan S, Veziroglu F, Dayangac E. Alveolar distraction osteogenesis versus autogenous onlay bone grafting for alveolar ridge augmentation: Technique, complications, and implant survival rates. Oral Surg Oral Med Oral Pathol Oral Radiol Endod 2010;106:511-5. Clavero J, Lundgren S. Ramus or chin grafts for maxillary sinus inlay and local onlay augmentation: Comparison of donor site morbidity and complications. Clin Implant Dent Relat Res 2003;3:154-60. Maestre-Ferrín L, Boronat-López A, Peñarrocha-Diago M, Peñarrocha-Diago M. Augmentation procedures for deficient edentulous ridges, using onlay autologous grafts: An update. Med Oral Patol Oral Cir Bucal 2009;14:402-7. Cordaro L, Sarzi Amadé D, Cordaro M. Clinical results of alveolar ridge augmentation with mandibular block bone grafts in partially edentulous patients prior to implant placement. Clin Oral Implants Res 2002;13:103-11. Urban IA, Nagursky H, Lozada JL, Nagy K. Horizontal ridge augmentation with a collagen membrane and a combination of particulated autogenous bone and anorganic bovine bone-derived mineral: A prospective case series in 25 patients. Int J Periodontics Restorative Dent 2013;33:299-307. Lorenzetti M, Vono M, Lorenzetti V. A retrospective tomographic and histologic analysis of horizontal bone augmentation in maxillary atrophic ridges using resorbable membrane with anorganic bovine bone-derived mineral and plasma rich in growth factors. Int J Periodontics Restorative Dent. 2018. doi:10.11607/prd.3082.